This is the 5th Generation USB power bank itorch for the latest iPad 3 "the new ipad" and smart phones iPhone 4s. It will never let your smart phones and Tablet PCs run out of battery. This compact and ultra long-lasting backup battery will be your perfect power solution on the go. When you travel, there's no need to charge your devices through an electrical outlet, the iTorch IMP520 is the ultimate power source! This is the 4th Generation USB type power bank which is compatible with latest iPad 2. It will never let your smart phones and Tablet PCs run out of battery. This compact and ultra long-lasting backup battery will let you carry the power source where ever you go. When you travel, there's no need to charge your device through an electrical outlet, THE IMP1000 IS THE ultimate POWER SOURCE! Take this with you whenever you go on a trip. This is the 4th Generation USB type power bank which is compatible with latest iPad 2. It will never let your smart phones and Tablet PCs run out of battery. This compact and ultra long-lasting backup battery will let you carry the power source where ever you go. When you travel, there's no need to charge your device through an electrical outlet, THE IMP1000 IS THE ultimate POWER SOURCE! Take this with you whenever you go on a trip. New Trent is a trademark of New Trent Inc, is exclusively marketed by authorized reseller idealpoint on amazon.com. 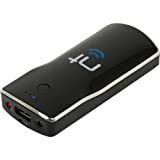 Key features includes -With the ground breaking capacity of 11000mAh at 5V output voltage, this tiny device can get you an extra 50 hours of iPhone 4 ipod touch movie time and 17 hours ipad 2 movie time. It is stylish and powerful! -This backup battery pack will work with almost every device in the market, such as your iPhone 4S 4 3Gs 3G (Verizon and AT&T), and 1G 2G 3G 4G iPod Touch, Motorola Droid, HTC Android EVO phones, and Samsung galaxy. -IMP1000 can also power Sony PSP and Nintendo DS lite, DSi, and Gameboy with additional adapters . Remember to look for the New Trent logo on retail box and product itself-- Be sure to find New Trent's logo on both package and battery pack to qualify for 6 months product warranty.